Since my last entry I have had the good fortune of speaking to some other people on Immunosuppresants – and they have confirmed what I was hoping. They are working to relieve my joint pain and that’s good news for me. Perhaps I can go back to being as active as I was all those years ago. I used to enjoy walking and running, all those activities. I stopped enjoying it when I my joints started getting worse. Saturday night we went to a Halloween party – and it was a lot of fun. First time in a few months we have been anywhere as a couple and it was nice to just be me and him rather than the masses amounts of labels we wear from day to day. During the day I went to my hair dressers, Karmah in Hair. I know a lot of the stylists pretty well there now – and they know me… and all about me. Funny how you can’t talk to your family but your hair dresser is all ears. Anyway – I was there to get something completely off the wall done with my hair – we went as Mrs Lovett and Sweeney Todd from the movie Sweeney Todd. Full photos are up on my Facebook – its not public but feel free to add me as a friend and check them out – I don’t bite. Monie the lovely young lady who is about to become a full-time member of staff took care of me and did a fantastic job. What a great girl all round. She spent over an hour putting my hair up and we got to talking about my health, she is curious and up front, both are attributes I like in other people. She asked about Crohns Disease and I told her – she listened intently and interested. – that’s one more person who wont just shut down if one of her friends pulls out the “I’m chronically ill” bombshell. At the end of a speech I am getting pretty used to now, I said, “in a way, I am glad I have Crohns – I am a different person than I was and I am actually starting to take care of myself”. Say what? I’m glad I have the disease of the damned? I guess – yes and no. Before the diagnosis – I was very driven. I didn’t want to let my company or my boss or my colleagues down (which I did every time I got sick and took time off). I pushed through even the worst days with just normal illness or Crohns related problems. I had no quality of life. I worked my behind off during the week – up to 50 or 55 hours (of just my normal, full time job) and let myself be sick on the weekend. I wasn’t getting many weekends where I was feeling well. Since Crohns, I have started to take care of myself. During the diagnosis I took a few sick days around the testing – I mean I needed them but ordinarily I wouldn’t have taken them. After the diagnosis I have started putting myself before work and before other people. I know that sounds selfish, but in reality, its not. Its plain and simple self preservation. I am taking days off when I need them, I am stopping to eat lunch and I am telling people that there is only one of me. And for the moment at least, that’s the truth. I hate being ill, I hate the medication and I hate the future repercussions of what I am having to do to myself now. But……. the fact I am actively taking care of my health and well-being, that’s a good thing that has happened since the diagnosis and I truly believe that I would never have gotten to this point without the involvement of Crohns disease. I have spent the last couple of days (yesterday being bed ridden from self inflicted illness) thinking about that statement… and to this point I can’t fault it. Life has returned to normal a bit more over the weekend… I had my first hangover in more than 12 months. Yes it was a doosie and yes I thought I could quite possibly die in the process. But it was normal… we were normal. 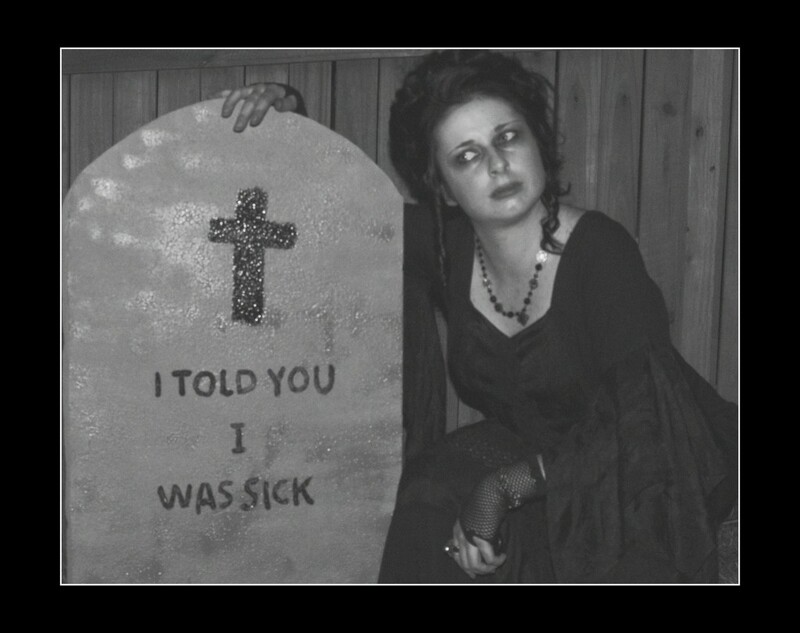 We got one pretty indicative photo that night – our friend ordered in some tombstones from the US one just happened to have a very apt tag line – take a look below.